Back of the Head: Smallville 9x8 - "Idol"
That's right, the Wonder Twins live in Metropolis. 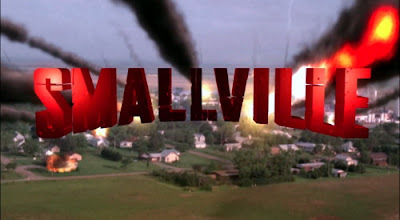 Before I get to that, last week was a particularly good episode of Smallville. "Kandor" featured the backstory between Zod, the Kandorians, and JOR-EL, played by Julian Sands. Through flashbacks on Krypton totally homaging the first 15 minutes of Superman: The Movie, we learned that Zod, the Kandorians, and Jor-El are all clones created by Jor-El meant to survive and live on if Krypton were destroyed. They all landed on Earth but because they were created before pivotal events like Zod becoming General Zod, the greatest villain on Krypton, and before the birth of Kal-El, and before Krypton's destruction, they had no knowledge of any of that. They also have no powers in the yellow sun through flaws in their design. Clark got to meet Jor-El right before he died at Zod's hand, putting a face to the disembodied voice in the Fortress, and Zod found out about who the Son of Jor-El is. It was, on the Smallville scale of quality, pretty good. Last week, Lois took the week off. She and Clark kissed two weeks ago and thus she bolted out of Metropolis and sought therapy. This episode was about her trying to reconcile her feelings for Clark and the Blur, whom she assigned Bonnie Tyler's "I Need A Hero" on her cell phone. Eventually she runs afoul of an evil Metropolis politician working with organized crime to expose the Blur and they throw her off the roof of the Daily Planet. In a riff off of Superman II, Clark tries to save her without using his powers while Lois tells him she knows he's the Blur. But thanks to the intervention of Chloe and the Wonder Twins, they bamboozle Lois into going back to thinking Clark isn't the Blur. Meanwhile, The Blur has inspired other superpowered meteor freaks to take up his mantle and be heroes. Two such heroes who have stepped up are Zan and Jayna, who have the exact same powers as their cartoon counterparts and bump their fists so their "Powers Activate!" Except each time they perform a super deed, they screw it up somehow yet still leave Clark's "S" shield in graffiti so the Blur ends up taking the blame for their blunders. They also pose as the Blur on Facebook and Twitter. Clark figures out who they are because Jayna dropped her cell phone, which has a picture of Gleek on it. Clark takes them both to Chloe in the Watchtower, where she starts training them on how to be a hero and more importantly, not to screw up the Blur's good name. She also makes them take down their Facebook and Twitter. When Zan and Jayna intervene and help save Lois, plus capture the evil politician, Clark reveals himself as The Blur to them and gives them a Superman style inspirational speech and thumbs up. All so silly, yet so entertaining for DC Comics nerds. In January, the Justice Society two-parter has been announced to air as a two hour TV movie, plus the Martian Manhunter is rumored to return for it as well. It'll be an all out DC Universe jamboree.